One of the areas where I expect the Titans to show improvement on defense is in the trenches. In fact, I expect the Titans defensive line to be outstanding in 2013. 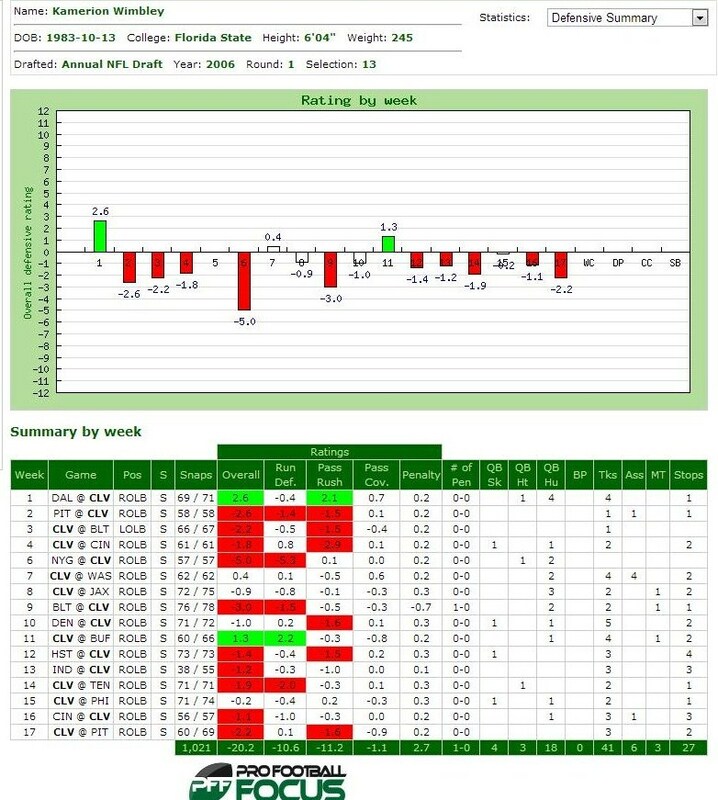 Better depth and rotation will allow Jurrell Casey, Derrick Morgan and Kamerion Wimbley to build upon solid 2012 seasons. I also expect to see guys shift and play different spots. Could the Titans have the best defensive line in the league in 2013? Let’s take a look. 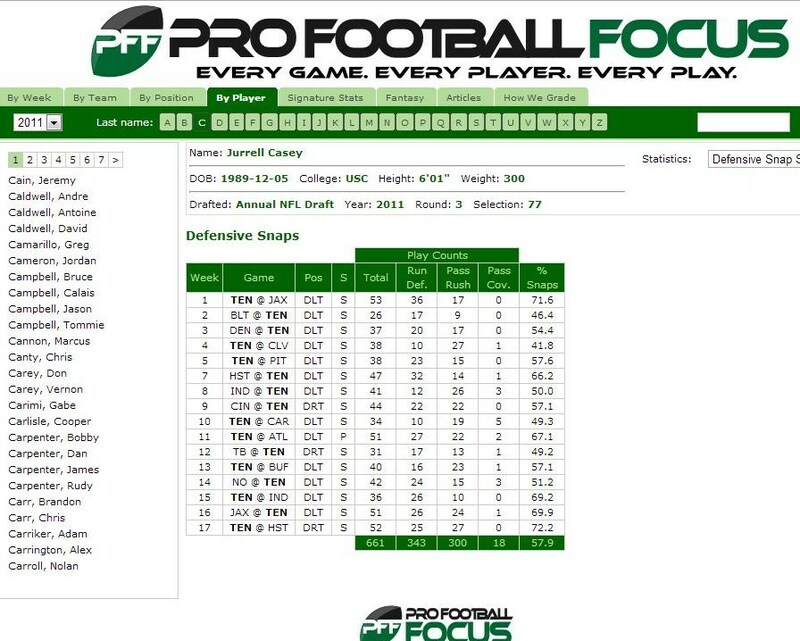 The 2012 defensive line was composed primarily of Jurrell Casey, Sen’Derrick Marks, Derrick Morgan and Kam Wimbley. Rookie Mike Martin rotated in at defensive tackle and performed quite well. 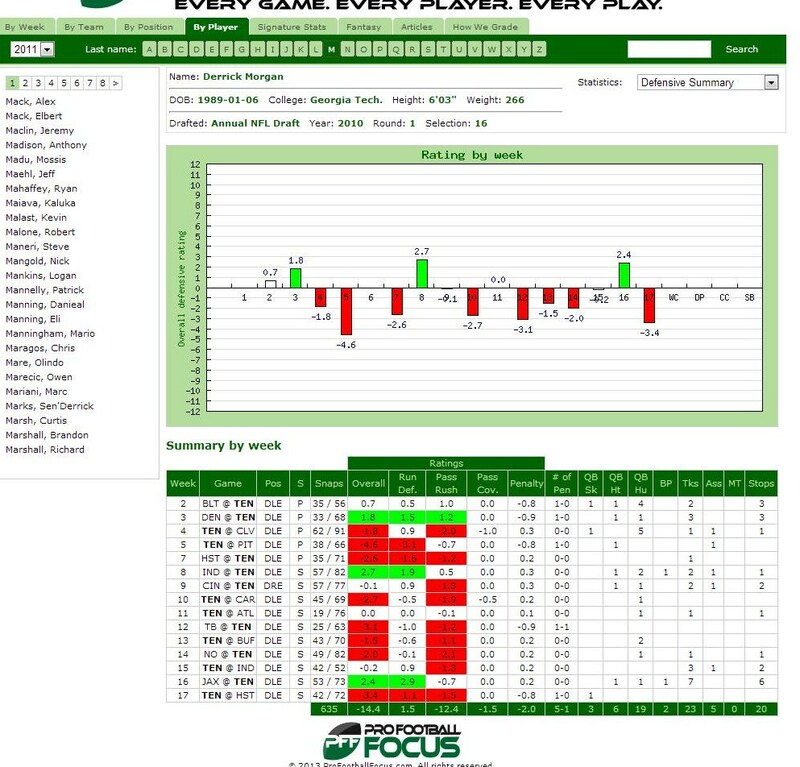 Unfortunately, until the Titans signed Jarius Wynn they had very little rotation at defensive end and Morgan and Wimbley played the majority of the snaps. 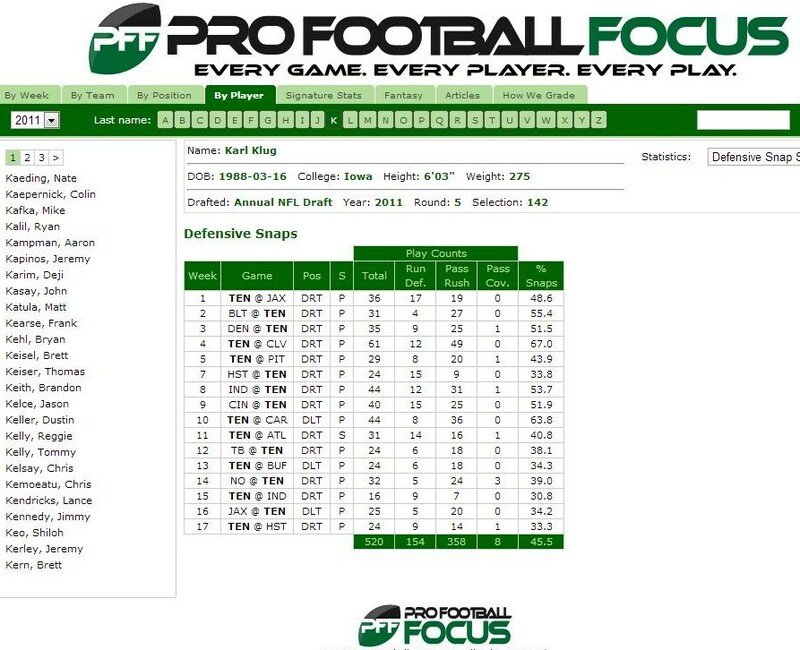 Karl Klug rotated sparingly at defensive tackle. 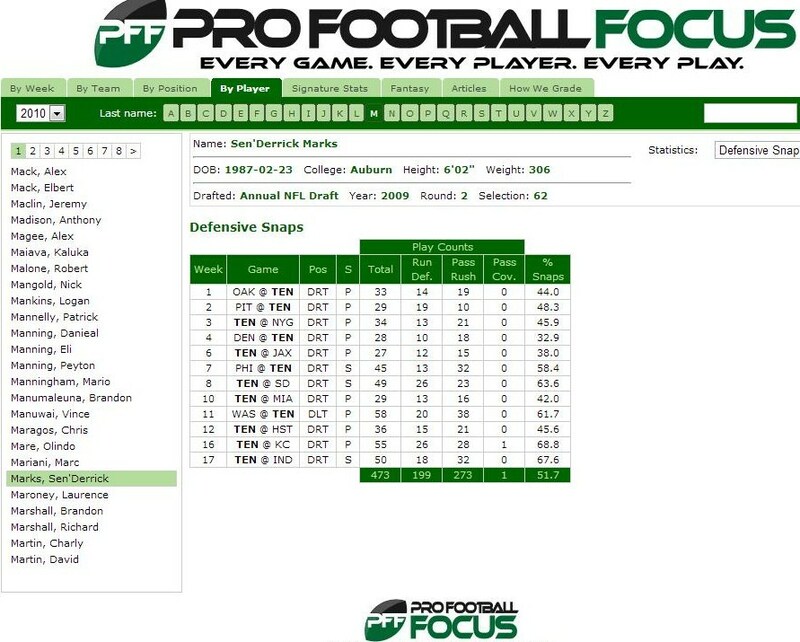 Let’s begin by taking a look at the 2012 Titans defensive line by position, player and collective stats, starting with the interior line. 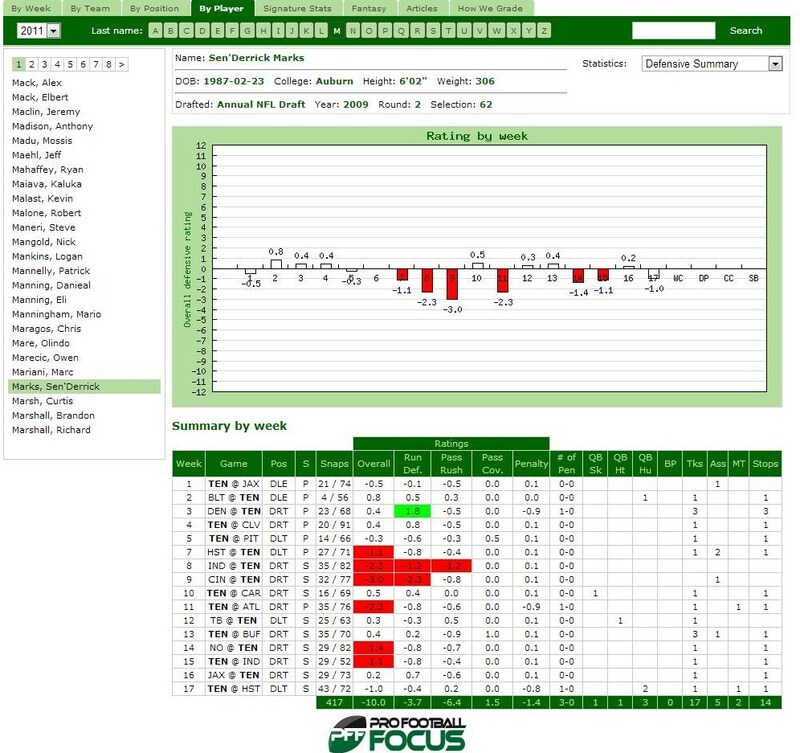 The Titans selected defensive tackle Jurrell Casey in the 2011 draft and he has played primarily on the left side, although they do like to rotate and he has played in the right side too. 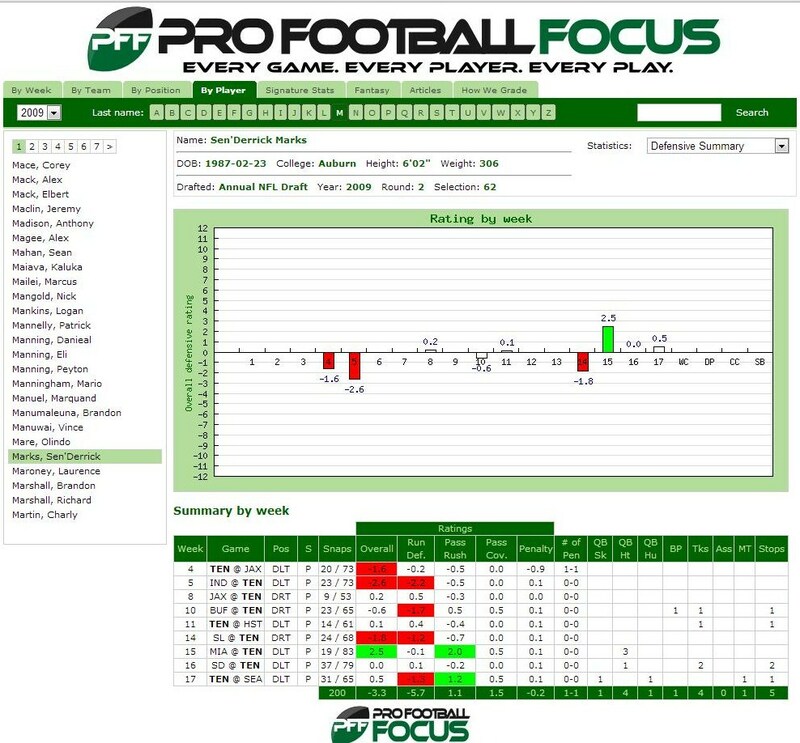 In 2012, Casey would play 789 snaps (68.7%) and register 3 sacks, 3 quarterback hits, 7 quarterback hurries, and 54 tackles. 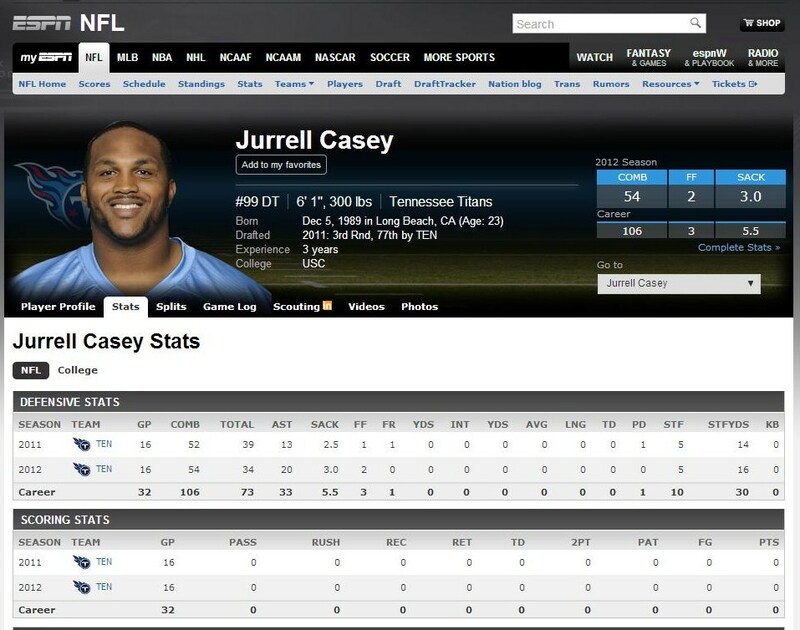 In 2011, Casey would play 661 snaps (57.9%) and register 3 quarterback sacks, 4 quarterback hits, 5 quarterback hurries, and 52 tackles. 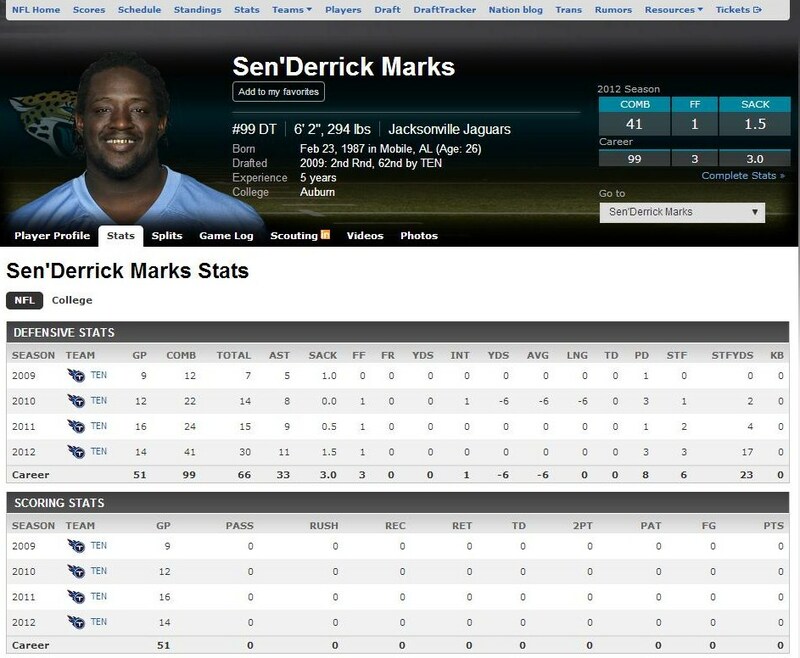 The Titans selected defensive tackle Sen’Derrick Marks in the second round of the 2009 NFL draft (overall #62). Like Casey, he has played both sides but he settled into the right defensive tackle spot in 2012 where he primarily played. In 2012, Marks assumed a starting role playing primarily at the right tackle position. He would notch 2 quarterback sacks, 6 quarterback hits, 12 quarterback hurries, 5 batted passes and 41 tackles. 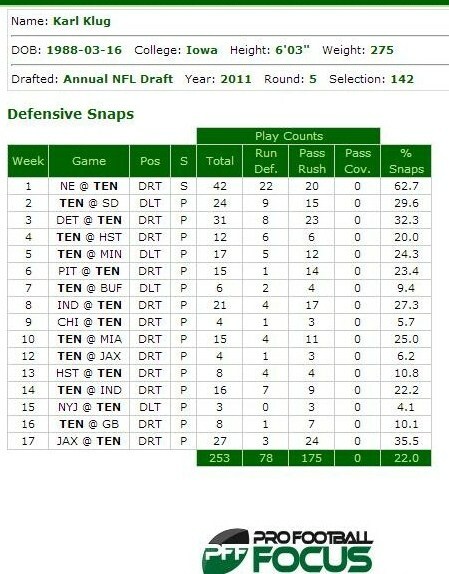 He played 691 snaps which was almost 70% of the the defensive snaps. 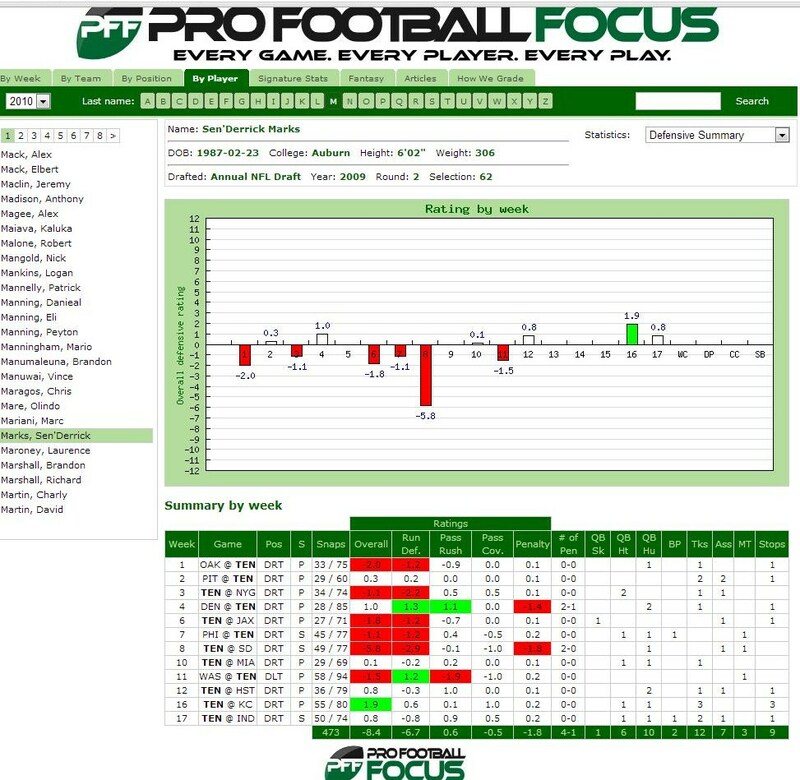 In 2011, Marks played in all 16 games but sparingly only registering 417 snaps or 36.5% of the defensive snaps. He registered 1 sack, 1 quarterback hurry, 3 quarterback hits, and 24 tackles. 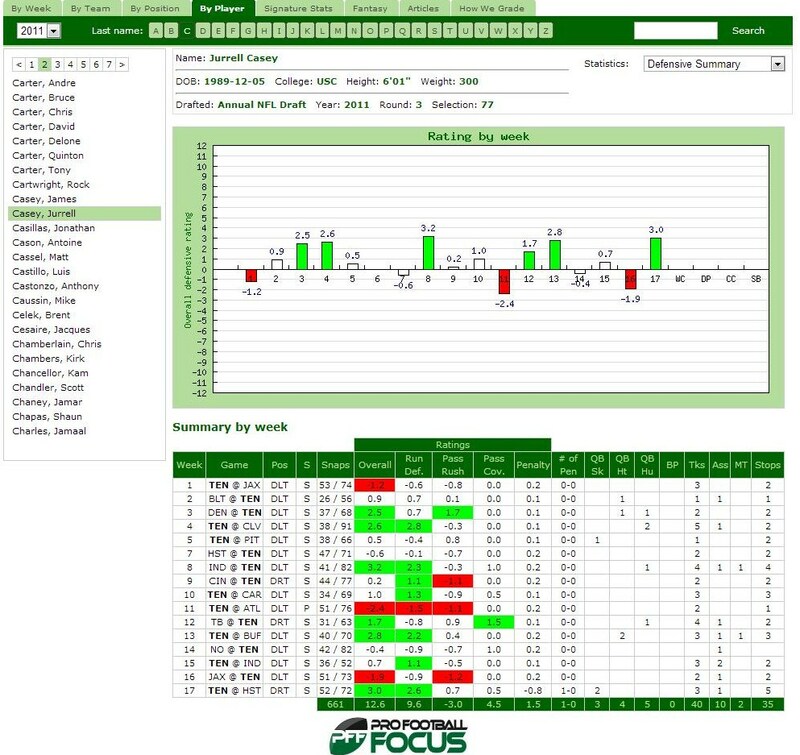 In 2010, Marks would play 13 games, 473 snaps, and register 1 sack, 6 quarterback hits, 10 quarterback hurries, 2 batted passes and 22 tackles. 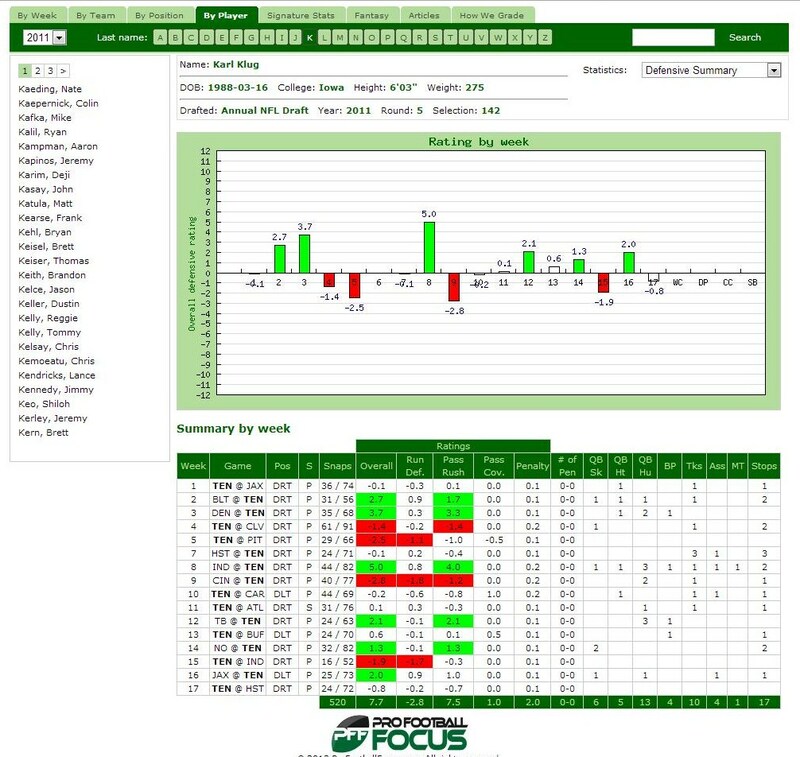 In 2009, Marks would play 200 snaps (32.3%) and register 1 quarterback sack, 4 quarterback hits, 1 quarterback hurry and 12 tackles. The Titans drafted defensive tackle Karl Klug in 2011 NFL Draft. He earned significant playing time his rookie year and led all rookie defensive tackles in sacks with 7 sacks. Klug had a down year in 2012 but is expected to earn playing time in rotation in 2013. 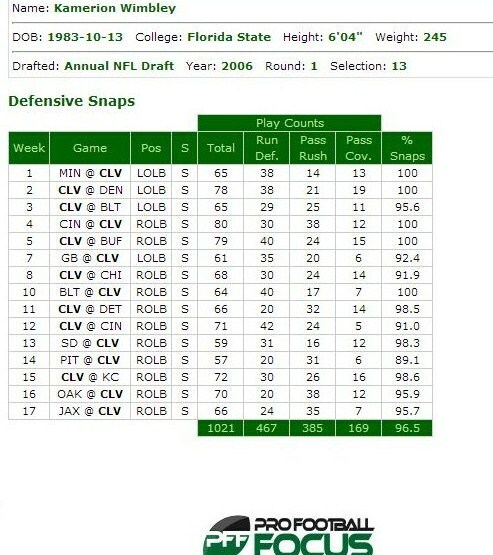 In 2012, Klug would play 253 snaps (22%) and register 4 sacks, 2 quarterback hits, 11 quarterback hurries, and 7 tackles. 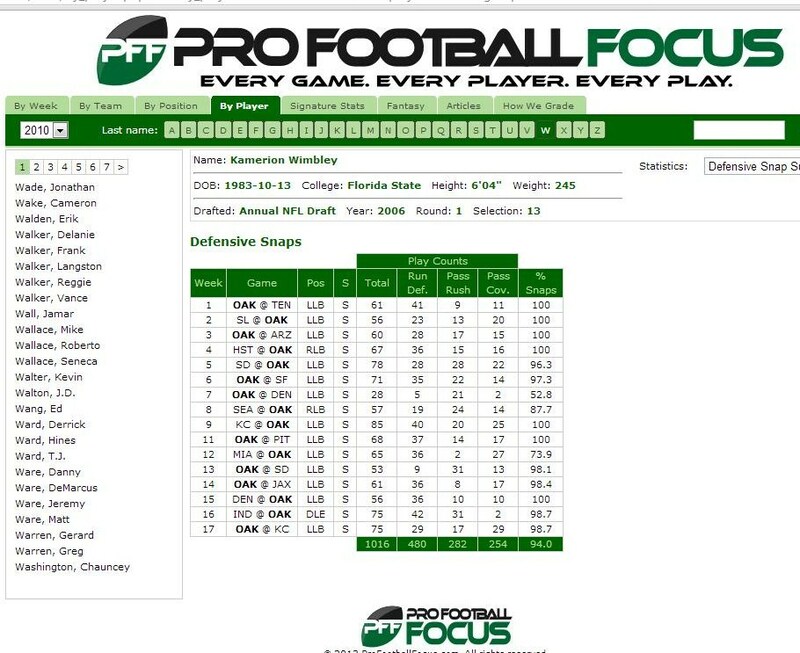 In 2011, Klug would play 520 snaps (45.5%) and register 7 sacks per the NFL (6 per PFF), 5 quarterback hits, 13 quarterback hurries, 4 batted passes and 20 tackles. 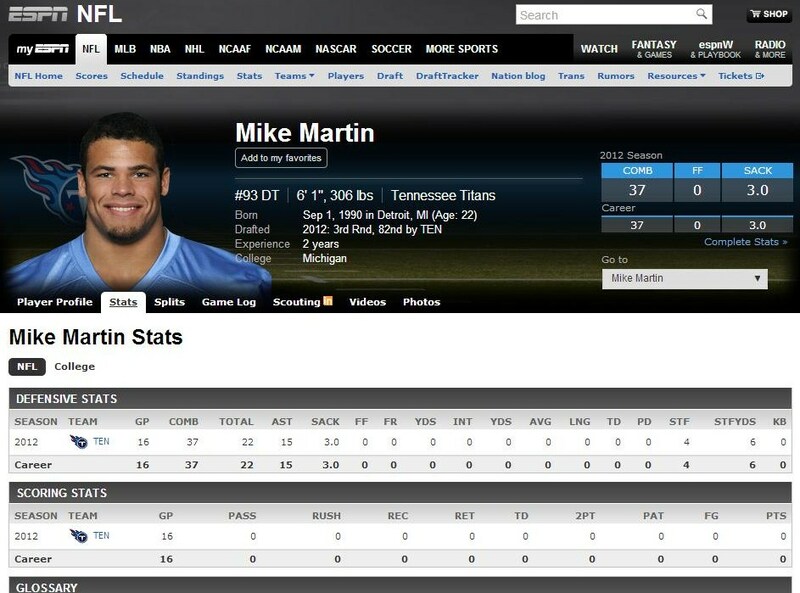 The Titans drafted defensive tackle Mike Martin in the 2012 NFL Draft. Martin earned significant playing time in 2012 and rotated between the left and right tackle position. 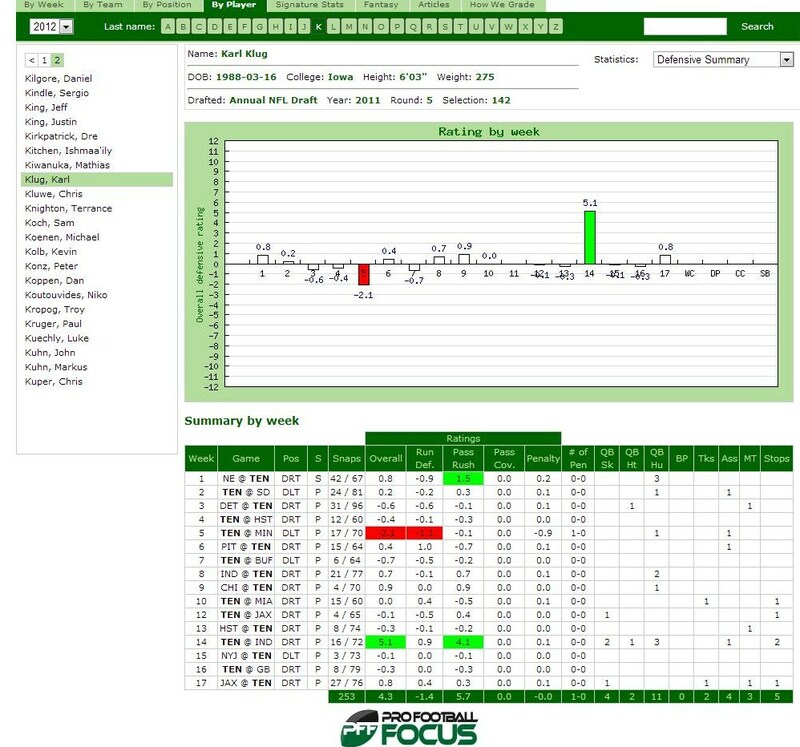 In 2012, Martin would play 435 snaps (37.9%) and register 3 sacks, 8 quarterback hits, 15 quarterback hurries, and 37 tackles. 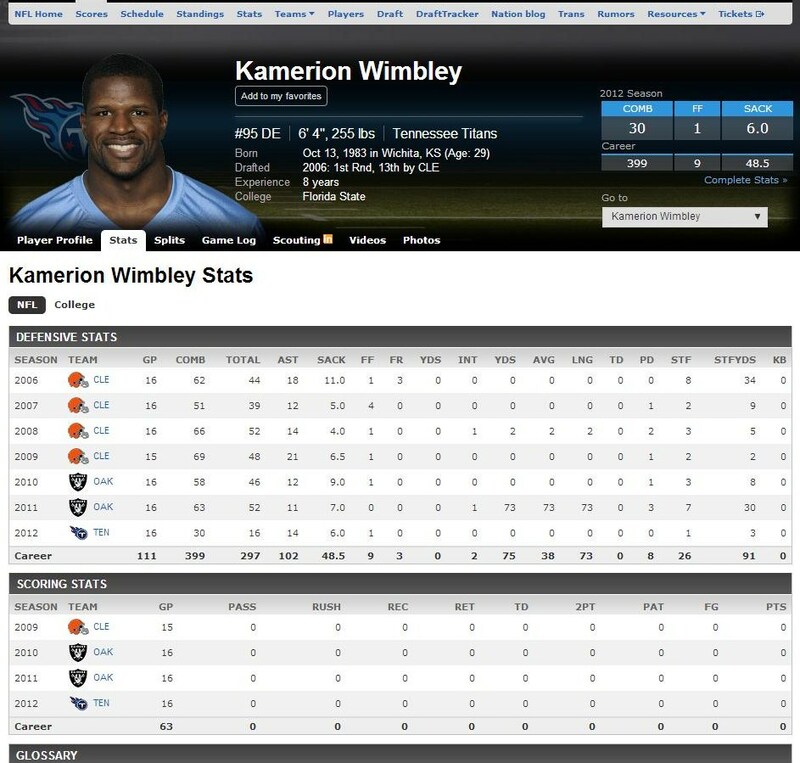 The Titans signed former Raiders and Browns defensive end/linebacker Kamerion Wimbley to a free agent contact during the 2012 offseason, and he started all 16 games at the right defensive end position. 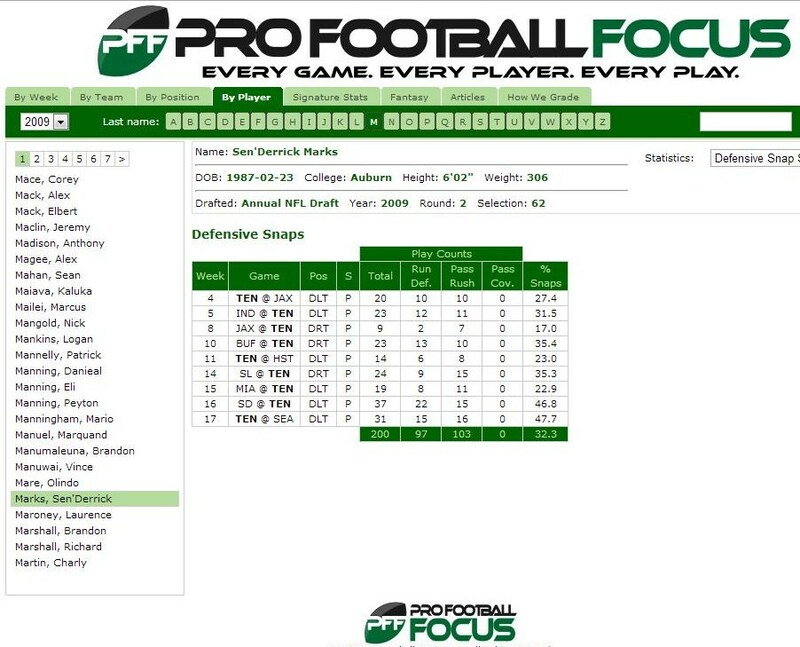 In 2012, Wimbley would play 924 snaps (80.5 %) and register 6 sacks (7 per PFF), 1 forced fumble, 4 quarterback hits, 47 (!!) quarterback hurries, and 30 tackles. Kam Wimbley has played a variety of positions and transitioned with the Titans from playing primarily strongside and right outside linebacker in a 3-4 defense to playing right defensive end in a 4-3 alignment. This required him to put his hand in the dirt and it was apparent early he struggle a bit with the adjustment. 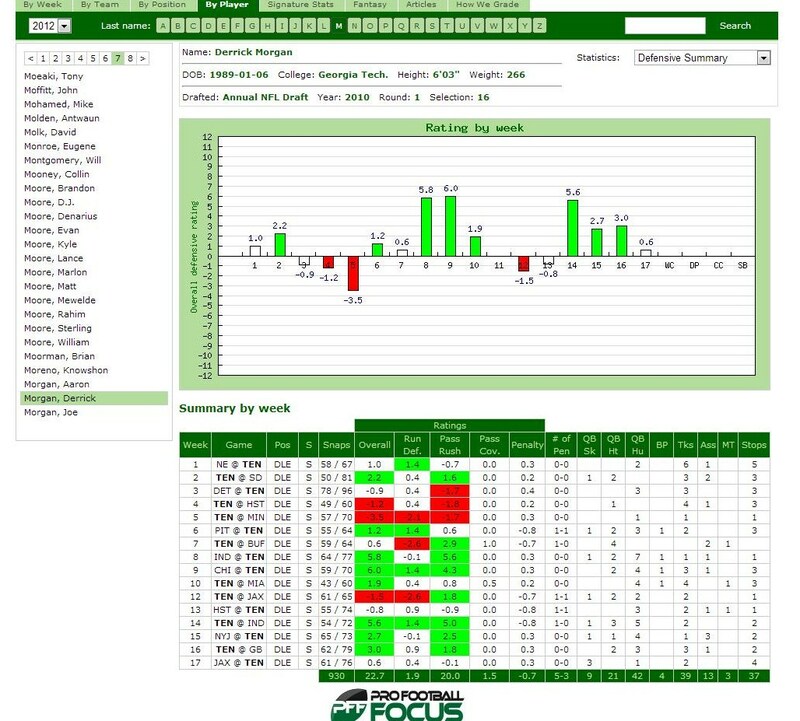 Once he became comfortable, he really came on, He would registered the bulk of his sacks, hits and hurries from games 6 through 12 although he would also put up a sack and a hit in game 17. 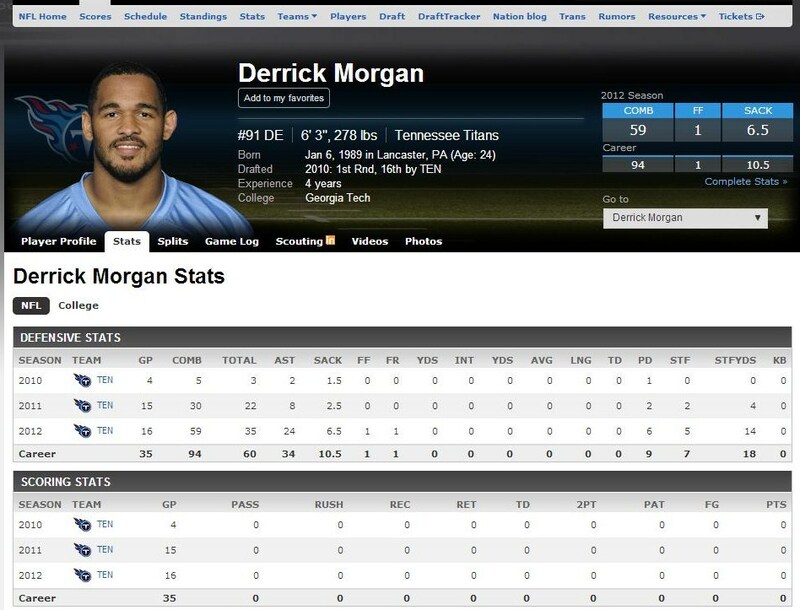 The Titans drafted Derrick Morgan in the 2010 NFL draft out of Georgia Tech and he started his first season. Unfortunately, his rookie campaign was cut short by an ACL tear and he struggled with some nagging issues in 2011. 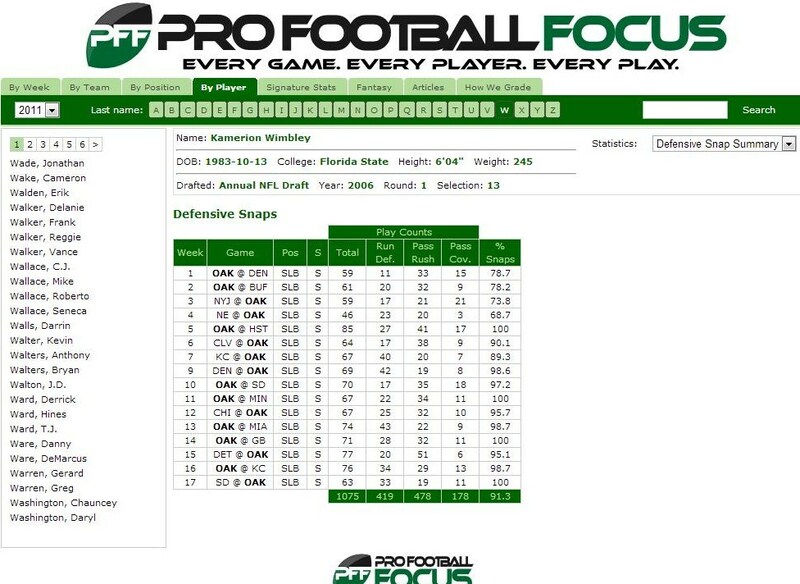 2012 was really a breakout year for Morgan who looks primed to be a real force in 2013. 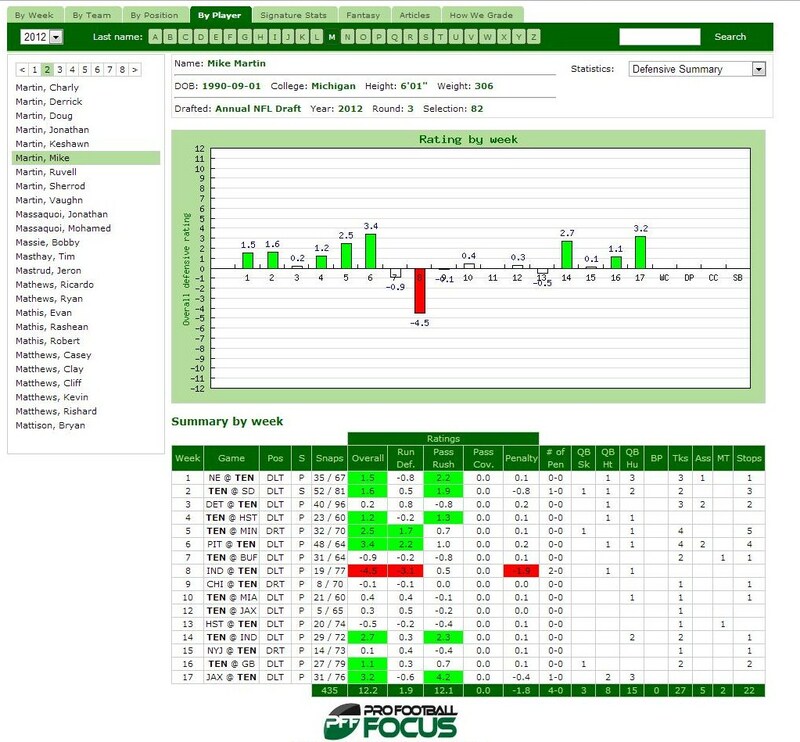 In 2012, Morgan would play 930 snaps (81 %) and register 6.5 sacks (9 per PFF), 42 quarterback hurries, and 59 tackles. 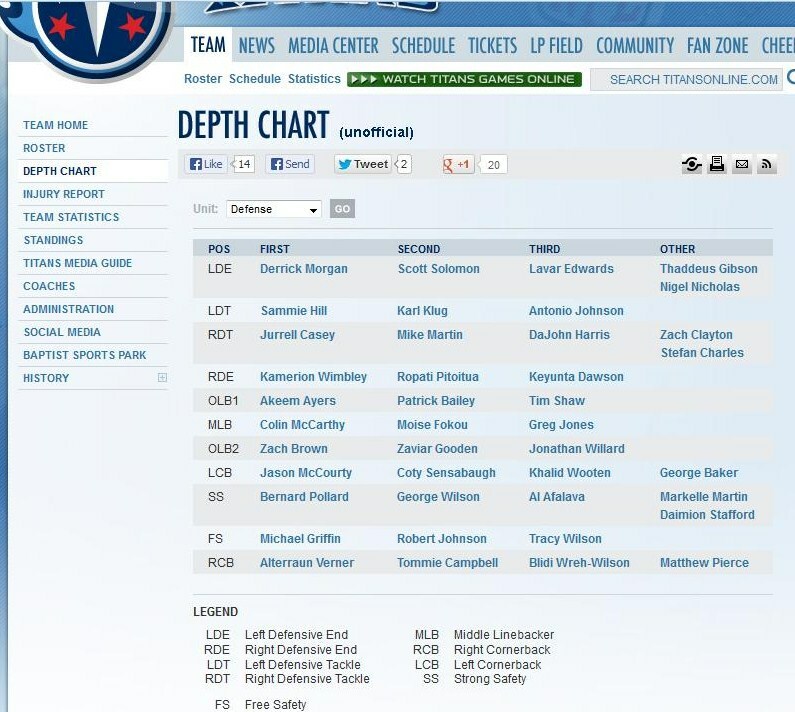 This is the Titans current depth chart. It doesn’t appear to be very accurate for several reasons. 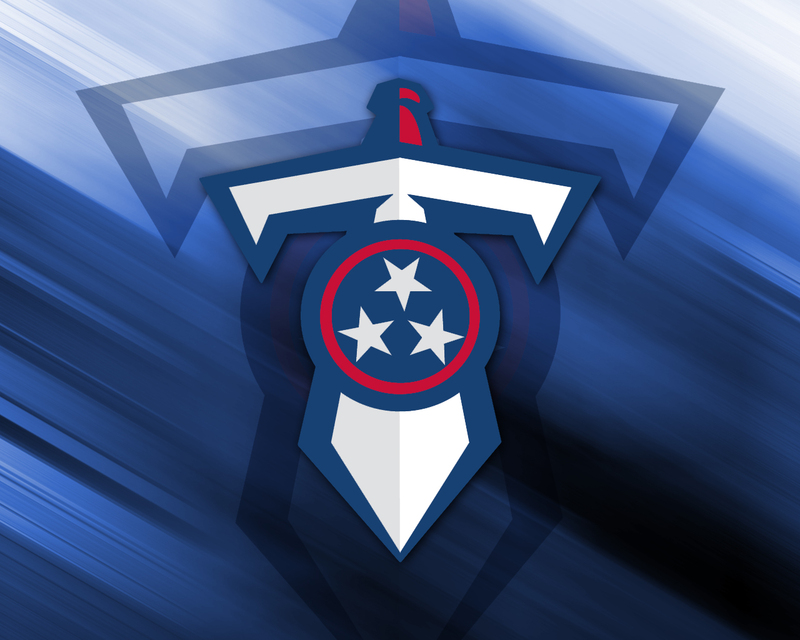 One, the Titans have moved Scott Solomon to strongside linebacker, a move I like a lot. At 6′ 3″ and 270, Solomon always struck me as a bit light at defensive end. Second, I don’t think you can peg Karl Klug anywhere as the Titans have said he will play both inside and outside, another move I like and will address in depth later. There are several defensive players I see playing a variety of positions and the primary candidates on the line are Karl Klug and Ropati Pitoitua. Both guys will rotate inside and outside depending on the circumstances. Klug I see rotating in at strongside defensive end and behind Hill at the tackle spot on the left. 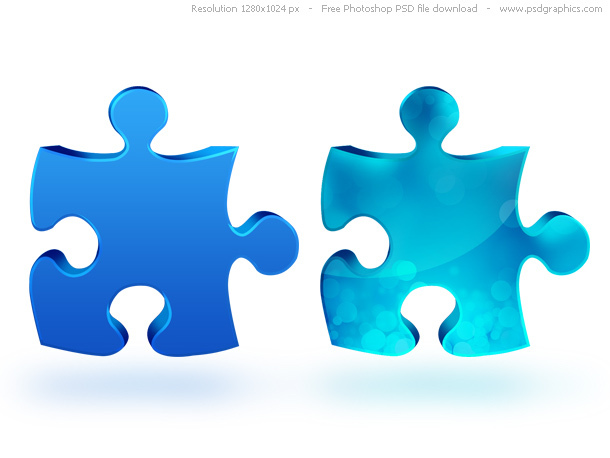 He could also rotate inside on the right as he has in the past as well. Pitoitua I see playing both positions inside in the base 4-3 and possibly nose tackle or both end positions in a 3-4 package. Speaking of shifting and rotating, mark my words (you saw it first here) but the Titans will rotate and shift their defensive linemen even more in 2013. It wouldn’t surprise me at all to see Morgan and Wimbley play opposite sides in some hybrid looks. Nor would it surprise me to see Morgan play inside and Wimbley shift to the linebacker spot on occasion. You can also expect to see Wimbley play OLB in a 3-4 look. The Titans added Sammie Lee Hill and drafted Levar Edwards. I previously took an in depth look at the difference between Hill and Marks. At least on paper this looks like an upgrade at the position although I do expect him to still rotate extensively. LeVar Edwards strikes me as a prototype left defensive end with good speed and quickness to rush the passer plus he is stout against the run. I think he will be a big contributor early on and will rotate in primarily on the left with some work on the right. Bonus factor in that he can also rotate inside and you can expect to see that happen too. Finally, while this may not qualify as a “new” addition the Titans did hire as “special assistant” an old face in former defensive coordinator Gregg Williams. I wasn’t fond of the move, but I do understand it and regardless of title Williams will be the force behind the defense. Williams has said he watched a lot of film during his suspension and you can bet he spent some time watching how the Bengals successfully rotate their front 7. I have also written about how I expect you will see Williams run the 4-4 defense too. I love the Titans making Karl Klug more versatile and using him in different ways. Klug got lost in the numbers game in 2012 but has the ability to make a difference whether it is inside or outside. Klug’s game is built on his ability to get off the ball incredibly fast and his excellent hand and feet work to elude pass blockers and get to the quarterback. Officially listed at 6′ 3″ and 275, Klug could still add 10 pounds without losing his explosiveness while improving his strength. 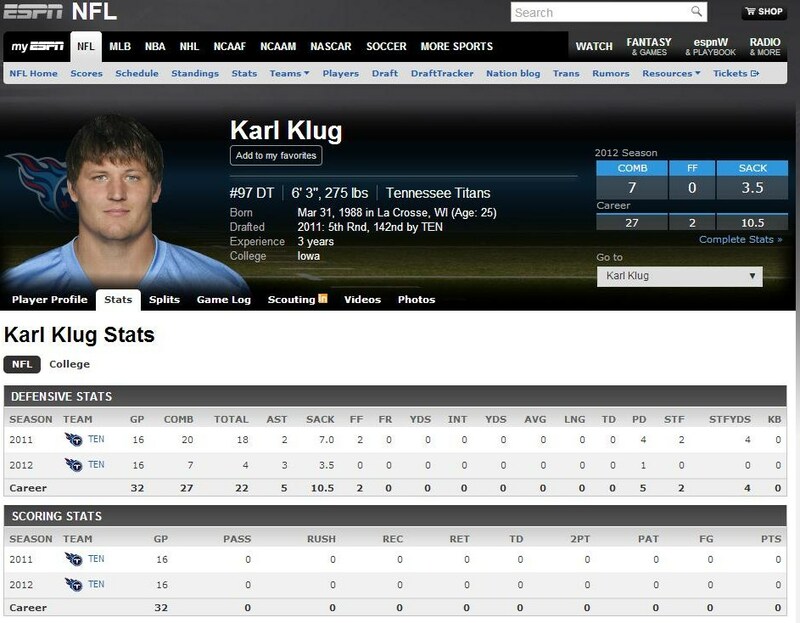 I expect Klug to garner more playing time in 2013 as the Titans focus on utilizing his skills. Again, I see him rotating at right defensive end while continuing to rotate in at both defensive tackle spots. 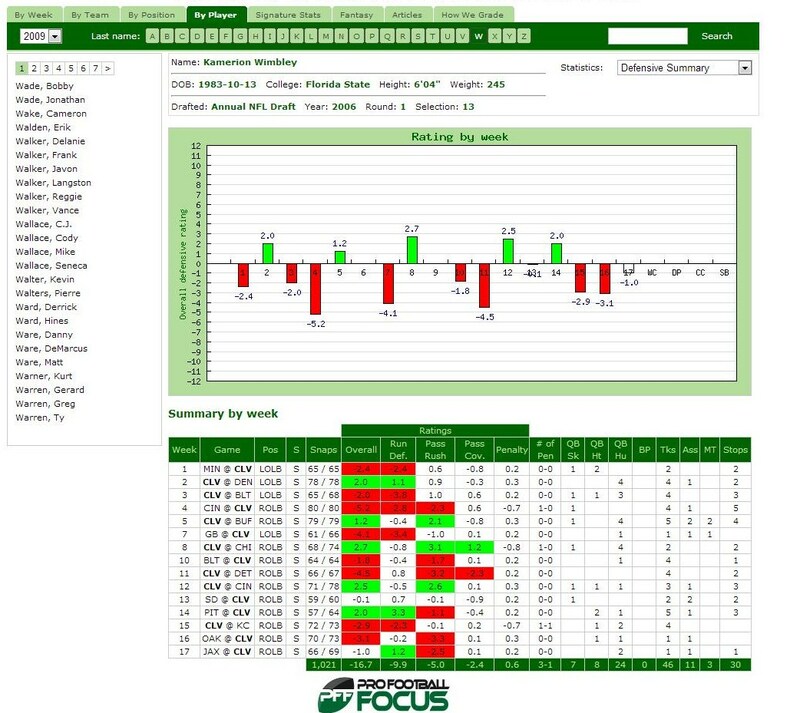 Furthermore, better rotation at defensive end will free Morgan and Wimbley up to build on 2012 and continue to make plays. 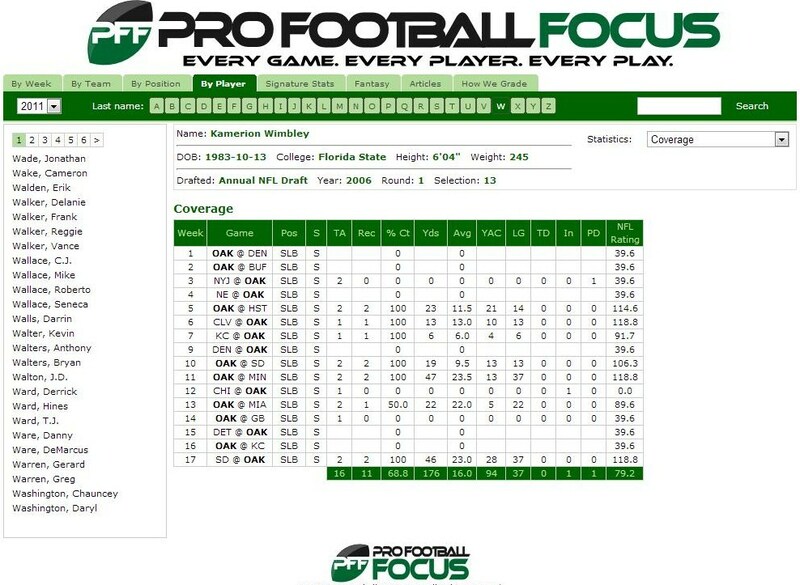 Here are some little known and even worst unrecognized facts about Morgan and Wimbley from PFF. 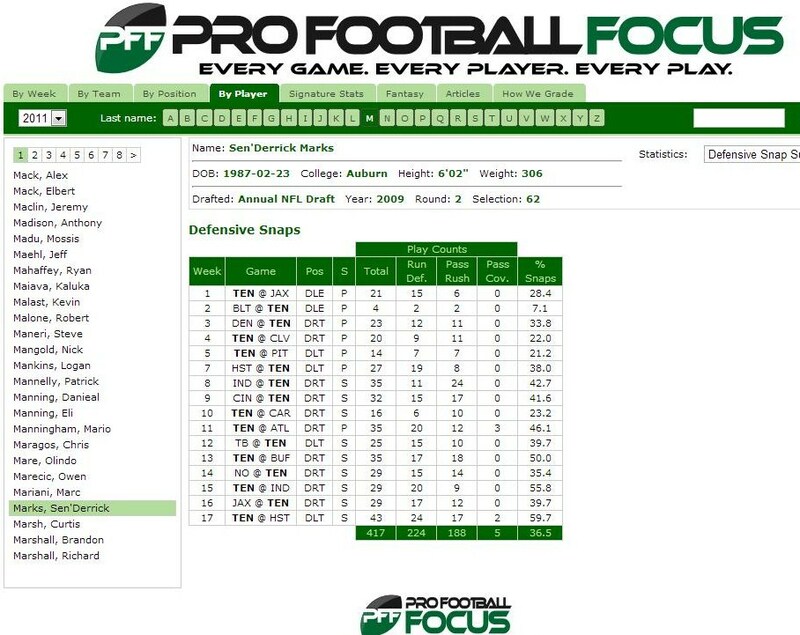 Both Morgan and Wimbley placed in the top 5 hurries amongst 4-3 defensive ends. 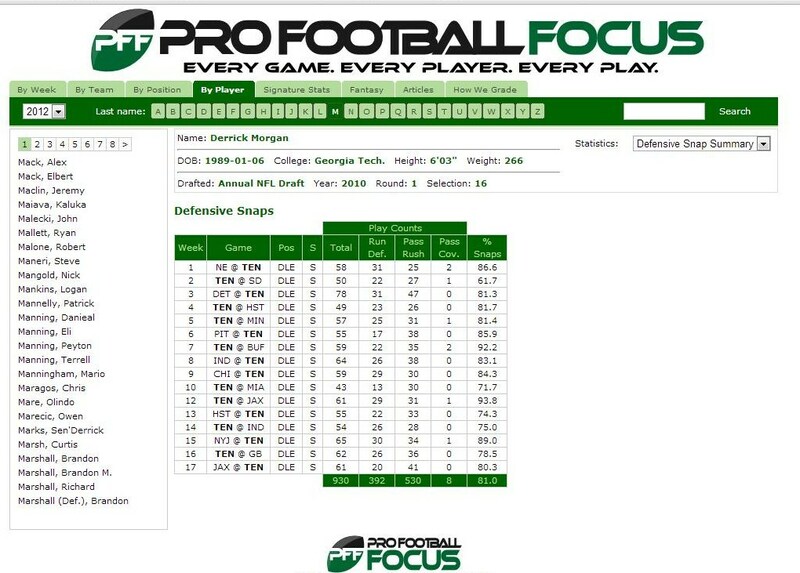 Morgan also ranked 2nd amongst left defensive ends for number of quarterback hits. Morgan was ranked 5th in quarterback hurries for 4-3 left defensive ends while Wimbley ranked 2nd in the league amongst 4-3 right defensive ends in quarterback hurries. Both Morgan and Wimbley were ranked 7th at their respective positions at defensive ends for number of sacks. The Titans defense was much maligned in 2012 but with improvement at the tackle position and better depth this line is poised to be a factor. I’m just not sure how I like the move of Casey to the right side. Casey is a very good 3 technique defensive tackle. I thought perhaps they might put Hill at right defensive tackle. 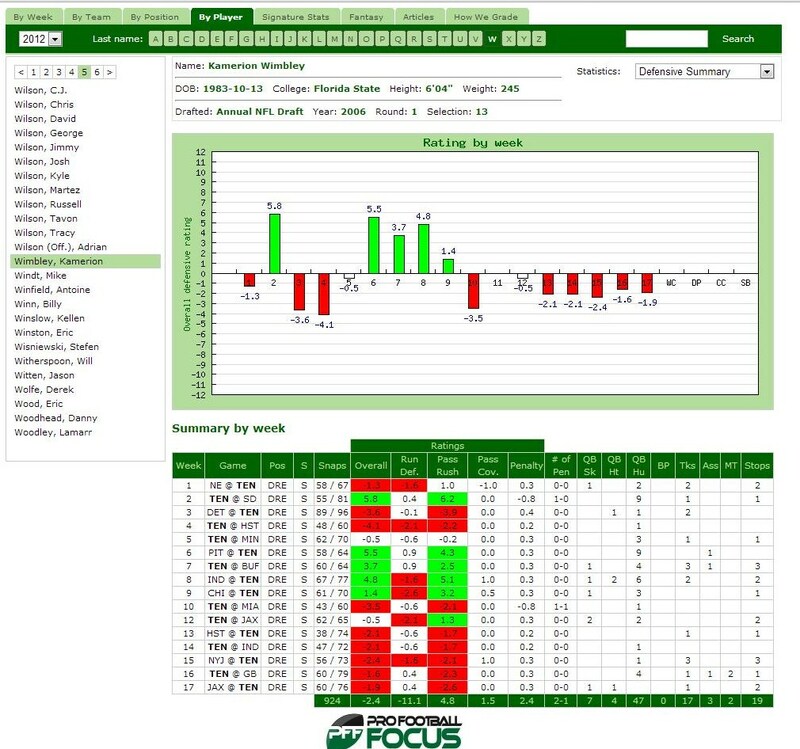 Here are some more stats per PFF. 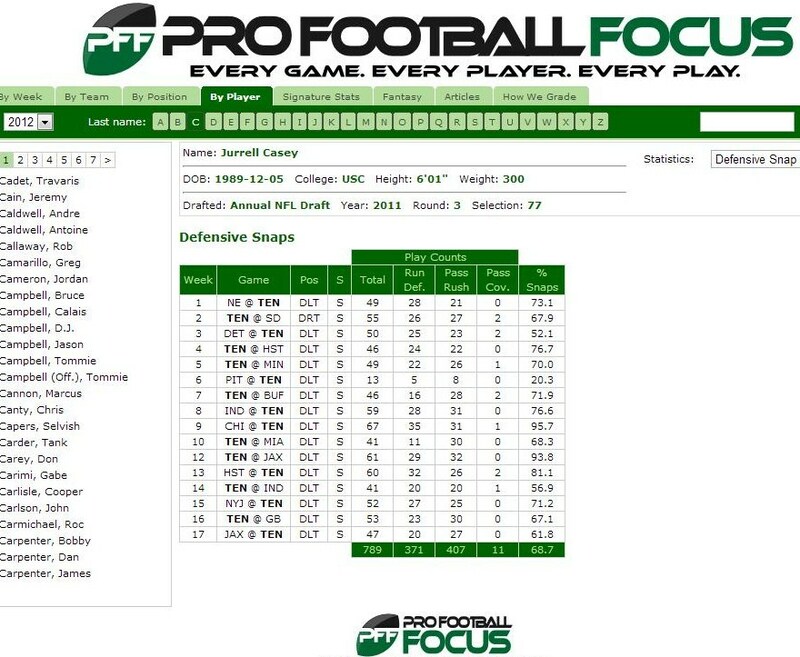 Casey was tied at 8th at 50% of snaps in the league amongst all defensive tackles at run stop percentage. At 75% of snaps, he moved up to 2nd place in run stop percentage. 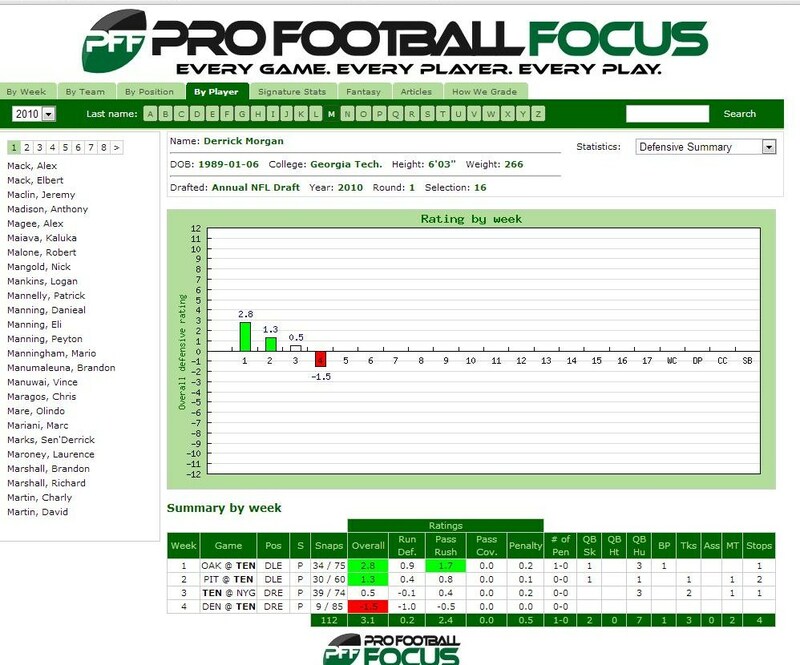 He only ranked 27th at pass rush productivity but at 60% stats moved up to 19th. This surprised me although I do wonder if all the attention he garnered was a contributing factor. For DT’s playing at least 25% snaps at pass rush productivity Mike Martin came in 4th while Karl Klug came in tied at 5th. 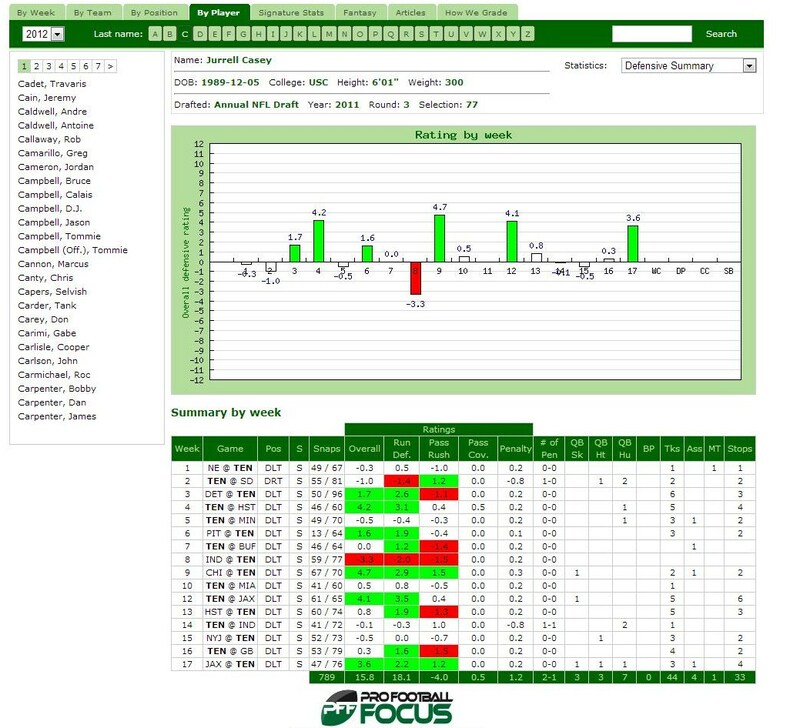 Hill ranked 15th in pass rush productivity at 25% of snaps. Generally speaking, you want your quickest and most agile tackle playing the left tackle position while the right tackle must be able to effectively occupy multiple blockers. In 2012, Casey regularly garnered double and triple teams and showed he was capable of handling the attention. Still, unless Hill is a better 3 technique candidate it makes more sense to keep Casey on the left side. I look for the Titans to rotate both guys to see where each fits the best. I see advantages to Casey playing either tackle spot and with Hill looking like an upgrade the interior should be greatly improved no matter how you slice it. In sum, the Titans have added pieces to make their line bigger, quicker and more versatile. Versatility being the key word here as you can expect the Titans to line up in a variety of ways in order to disguise where the pressure will originate. 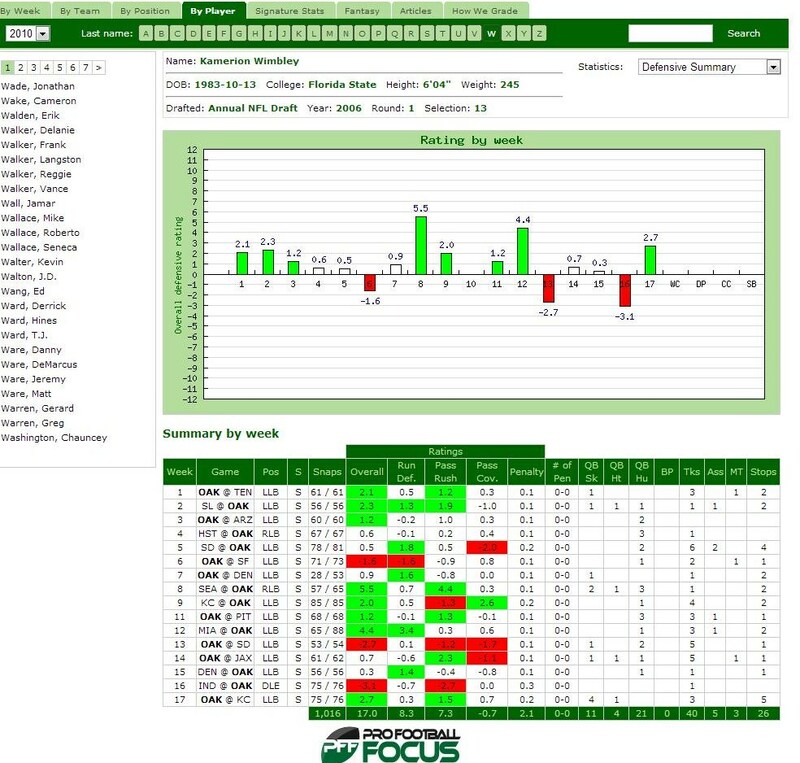 All this should make for a more effective pass rush and a greatly improved run defense. 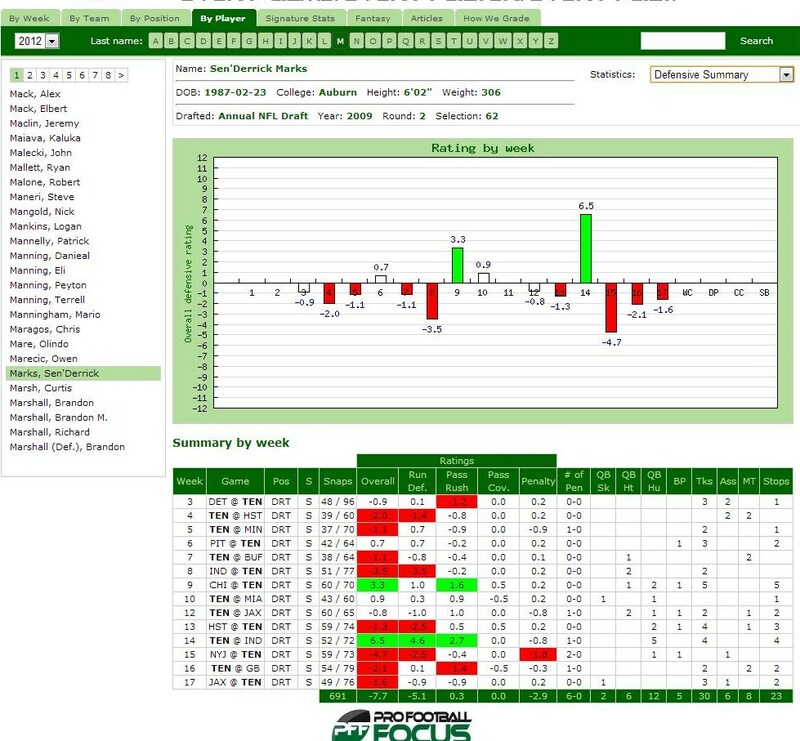 I expect to see the defensive line rotate players and positions regularly and that it will equate to a better overall defense in 2013. Can the Titans defensive line be the best in the league in 2013? I think so but only time will tell. Since some people have asked I want to mention a few things. One, yes I do think Akeem Ayers could slide to defensive end on occasion. 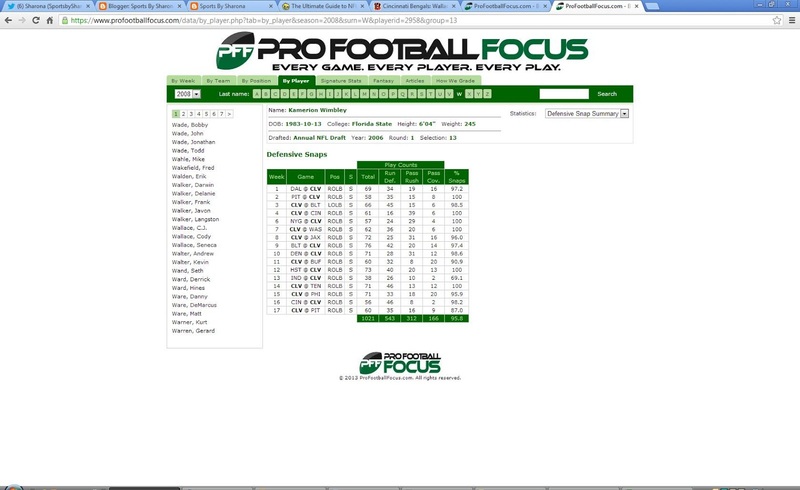 I didn’t address it here but I plan to take a similar look at the linebackers so stay tuned. Also, no I didn’t put Karl Klug or Ropati Pitoitua on the depth chart for reasons I address in the section on swing players. Point being they will play multiple spots and putting in a pigeonhole wasn’t my purpose. Yes, I think they make the roster. **Also, now that I have looked at the roster, I think either Pitoitua or Dawson will be a victim of numbers and I went with Pitoitua. It will be interesting to see how the competition on the back end shakes out during training camp.